How to Lose a Job by Becky A. Bartness, a Mysterious Review. 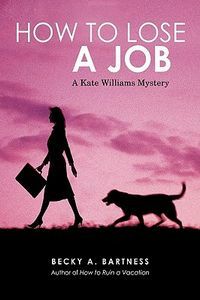 Review: Kate Williams so much enjoyed her time in Arizona (the setting for the first mystery in this series) that she decides to move there, quitting her high-stress job in Chicago for a presumably more tranquil routine in How to Lose a Job, the second mystery in this series by Becky A. Bartness. After working 14 years as a successful criminal law attorney, Kate accepts a position with the Maricopa County (Phoenix) Attorney's Office. It doesn't pay nearly as well, but the quality of life is better. Getting settled in means reviewing current cases before the county, and what she sees is puzzling. Cases that should have been classified as misdemeanors are entered as felonies. Cases that should have been dismissed for lack of evidence are still active. As Kate and her assistants delve deeper, she runs the risk of antagonizing her supervisor, Stan Rantwist, a religious fanatic with his own agenda: ridding the county of sin and using a "higher authority" as both his spiritual and legal guide. Kate enlists the help of the deputy sheriff, and together they discover an extensive drug trafficking ring that may have links to the County Attorney's Office. But can Kate sort all this out before she's given her walking papers and loses her new job … or worse? How to Lose a Job is filled with delightfully quirky characters, especially Kate's assistants, the heavily tattooed and pieced MJ and the obsessive/compulsive clean freak Sam. Kate, herself, is quick and witty, and her new dog Ralph always brightens the narrative whenever he's present. The story is light and breezy, and fits well with the characters and setting. How to Lose a Job is an entertaining mystery and makes for a pleasant way to spend a lazy Saturday afternoon. Special thanks to guest reviewer Betty of The Betz Review for contributing her review of How to Lose a Job. Acknowledgment: Becky A. Bartness provided a copy of How to Lose a Job for this review.